In a year of already failing rain and declarations of impending drought, government data on the crisis-ridden agriculture sector that sustains more than 600 million Indians--or half the population--appears to reveal ever-increasing spending. India’s agriculture budget doubled over five years to Rs 57,600 crore in 2018-19 under the National Democratic Alliance (NDA) government, three times that of the last United Progressive Alliance (UPA) government budget in 2013-14, with the highest increase of 79% over the previous year coming in 2016-17. As a proportion of the total budget, however, the NDA’s allocations for agriculture were largely static, at an average of 2% over the past four years, rising from an average of 1.3% during the second term of the UPA, according to an IndiaSpend analysis of budgetary data. In 2018-19, it rose 2.3% over the previous year. Agriculture generates only 18% of gross domestic product but sustains 600 million people--half of India’s population. Nearly 69%, or 833 million Indians--most of them poor--live in rural areas. Agriculture is thus likely to receive extra attention in the NDA’s last budget before the next general elections in April-May, especially after the Bharatiya Janata Party (BJP), which leads the NDA government, lost three Hindi-heartland states--Rajasthan, Madhya Pradesh and Chhattisgarh--in assembly elections in December 2018. Commentators have said farm distress was a factor in these electoral reverses. In November 2018, protests by more than 200 farmer groups demanded better prices for produce and “freedom from debt”. It is thus likely the government’s interim budget before the general elections will include a relief package for farmers. With the NDA promising to double farm incomes by 2022, the budget’s priorities should be--experts told us--more money and more research for agriculture and public investment. 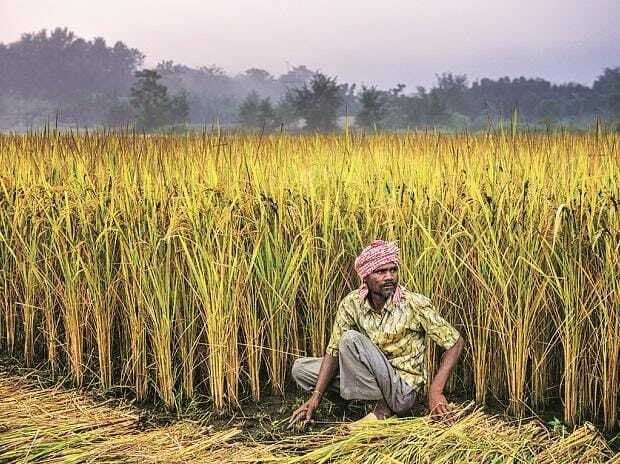 The budget will be dedicated to farmers in the country as part of the government efforts to double their income by 2022 said Radha Mohan Singh, minister of agriculture, Business Insider reported on Jan 24, 2019. But there are larger problems that the budget must address to mitigate the agricultural crisis--and win over farmers. About 70% of rural households depend primarily on agriculture, and nearly 86% of India’s farmers are categorised as “small and marginal”, meaning they own less than two hectares--the size of 2 football fields--according to the agriculture census 2015-16. The average debt per indebted rural household in 2013 was Rs 103,000--almost equal to the price of a Royal Enfield Bullet 350--IndiaSpend reported on January 4, 2018. Meanwhile, billionaire fortunes in India increased by 35% last year, at the rate of Rs 2,200 crore a day, while 136 million who make up the poorest 10% of Indians continued to remain in debt since 2004, noted a January 2019 report by international non-governmental organisation Oxfam, indicating the gulf between urban and rural incomes. Given their economic condition, nearly 69% of the farmers surveyed by Delhi-based think tank Centre for the Study of Developing Societies (CSDS), thought that city life would be better than village life, said a CSDS report in March 2018. The average monthly surplus available to a rural Indian home, whether a farm or non-farm household, was Rs 1,413, IndiaSpend reported on September 24, 2018. The growth in the agriculture, forestry and fishing sector’s gross value added (GVA) --a measure of income before produce is sold--was estimated at 3.8% in 2018-19, compared to 3.4% in 2017-18, according to the government’s first advance estimate on national income for 2018-19. But the share of this sector in GVA declined 1.8 percentage points to 16.4% over five years to 2017-18 (first advance estimates), according to the Economic Survey 2017-18. Since April 2017, eight states have announced farm loan waivers worth Rs 190,000 crore and the central government has increased the procurement price for both kharif (monsoon) and rabi (winter) crops. Yet, farmers remain discontent, saying these increases did not meet the levels prescribed by a committee set up in 2004, headed by noted agriculture economist MS Swaminathan. A key problem, some experts argued, is that there are too many farmers on too little land. Over 45 years to 2015-16, the number of farms in India more than doubled, from 71 million in 1970-71 to 145 million in 2015-16, while the average farm size more than halved from 2.28 ha to 1.08 ha, according to the agriculture census. An indication of the distress is an almost eight-fold rise in ‘agrarian riots’ between 2014 and 2016, a Livemint analysis of data from the National Crime Records Bureau shows, which included conflict over land and water. In 2017, 18% of Chinese were employed in agriculture compared to 43% of Indians, according to World Bank data. Over 26 years till 2017, the proportion fell 37 percentage points in China, while in India it fell 21 percentage points, keeping India above the world average of 26.4% of people employed in agriculture. India’s farms are producing enough foodgrain for its people. India produced 252 million tonnes by 2015-16, and by 2017-18, foodgrain output is likely to reach 285 million tonnes, according to the fourth advance estimates of crop production, released in August, 2018. India’s foodgrain requirement for 2025 should be 300 million tonnes according to a March 2017 report from Delhi-based think tank PRS Legislative Research (PRS). Despite these high levels of production, agricultural yield--quantity of a crop produced on a unit of land--in India is lower than many other countries. India is the second largest producer of paddy in the world after China, but, even though India’s paddy yield increased 2.5 times over 56 years to 2017, its yield (3.8 tonne/ha) was almost 18% lower than China’s in 2017. Brazil (6.2 tonne/ha) and USA (8.4 tonnes/ha) too had higher yields. Although agricultural income is not taxed in India, farmers have been “‘implicitly taxed’ through restrictive marketing and trade policies that have an in-built consumer bias of controlling agri-prices,” Ashok Gulati, agricultural economist, wrote recently, based on a 2018 study on agriculture policies in India over the last two decades. The study valued the implicit tax burden on farmers at Rs 45 lakh crore for 2000-01 to 2016-17, at 2017-18 prices--which amounts to Rs 2.65 lakh crore per annum. Between 2014-16, gross farm revenue reduced 6% despite subsidies for fertilizer, power and irrigation “which offset somewhat the price-depressing effect of market interventions”, the study added. Further, India’s spending on agriculture research (as a percentage of agriculture GDP) is 0.3%, The Hindu BusinessLine reported on Oct 11, 2018. China, US, Brazil and South Africa spent twice, 4 times, 6 times and 10 times more than India, respectively, it added. The budget for agriculture in 2018-19 increased 13% to Rs 57,600 crore from the previous year. This increase however amounted to just 2.3% of the total budget of Rs 24.4 lakh crore, similar to that allocated in 2017-18, despite a nearly 13.5% increase in the total budget. Between the first UPA-2 budget in 2009-10 to the latest NDA budget in 2018-19, the allocation for the ministry of agriculture and farmer welfare (MoAFW) increased 5 times to Rs 57,600 crore. The interim budgets of 2009-10 (11,805.9 crore) and 2013-14 (Rs 11,634 crore) were similar in their allocations to the sector. In close to a decade till 2017-18, actual expenditure was less than budgeted expenditure in all years, except for 2010-11 and 2016-17, a PRS analysis found. In 2016-17, the interest subvention--interest subsidy to farmers on short term credit-- was added to the MoAFW’s allocations. In the last budget, about Rs 38,924 crore--67.6% of the total agriculture budget--was proposed to be spent on five schemes targeting farmers; Interest Subsidy Scheme (32% of total agriculture budget), Pradhan Mantri Fasal Bima Yojana [Prime Minister’s crop insurance scheme, PMFBY] (28%), Pradhan Mantri Krishi Sinchayee Yojana [Prime Minister’s Irrigation Programme, PMKSY] (9%), Rashtriya Krishi Vikas Yojana (8%), and National Mission of Horticulture (5%), the PRS report added. Over the five years till 2018-19, the funds (budget estimate) allocated to the MoAFW is Rs 209,084 crore. Although 2018-19 had the highest allocation, 2016-17 saw a 79% increase in allocation to Rs 44,485.2 crore over the previous budget. Budget 2015-16 saw a 20% fall in allocation over 2014-15. With agriculture in India dependent on rainfall, and with drought affecting several regions, PMKSY was launched to increase the area under irrigation. But, since its launch in 2015, actual expenditure on PMKSY has fallen short of budgeted expenditure all years till 2017-18, the PRS report noted. Similarly the actual expenditure for PMFBY was 17% less than the revised budgeted amount of Rs 13,240 crore in 2016-17, based on budget data. The budget estimate in 2018-19 was 22% more than the revised estimate of the previous year. Based on GDP back series data, the average annual growth rate in agriculture and allied activities from 2009-10 to 2012-13 was around 3.9% while the average annual growth rate during the first four years of the NDA regime was 2.52%, Business Standard reported on November 29, 2018. During the two UPA governments--from 2004-05 to 2013-14--the average annual farm growth was 3.8%, it added. “The UPA-1 [2004-09] definitely led to better income for farmers and trade, helped farmers tide over the crisis that existed in the previous NDA government,” Himanshu, associate professor of economics at Jawaharlal Nehru University (JNU) told IndiaSpend. “This government has destroyed the gains made during the UPA period. Although there was some deceleration in the later part of UPA-2, the present government was the beneficiary of windfall gain of oil prices going down. The consumer prices were not reduced despite the fall in oil prices, and the revenue from it should have been used to provide relief for farmers,” he added. One of the priorities must be to allocate “50% of the budget to agriculture and rural affairs,” Devinder Sharma, an agriculture expert, told IndiaSpend, due to the extent of farm distress. Further, there is a need to set up a commision for farmers’ income and welfare, provide direct income support in 60 to 40 ratio between centre and state, and redesign the Fiscal Responsibility Budget management Act to open up the present restriction of 3% state fiscal deficit, Sharma added. “The government should have thought about the sector more in the last four years. Now, in the short term all that can be done is to provide relief,” said Himanshu. Income support schemes like Rythu Bandhu in Telangana and Krushak Assistance for Livelihood and Income Augmentation in Odisha have a fiscal cost, he added. It is “election propaganda” with Odisha assembly elections scheduled this year, as it was in Telangana, said Himanshu. Why are farm loan waivers met with such a hue and cry when corporates and industries receive tax benefits, asked Sharma. He had pointed to an Indian Express report on September 17, 2018 saying government had announced three stimulus packages to boost the economy in the space of three months between December 2008 and February 2009, totalling Rs 186,000 crore or 3.5% of the GDP. We must be able to provide income for the poorest in India, said Sharma. IndiaSpend has written to the agriculture minister, copied to the minister of state and ministry secretary for comments, and followed up with a reminder. We will update the article if and when we receive their reply. Although some would argue that agriculture allocation should be based on the sector's contribution to GDP, we should consider that more than 50% of the people depend on agriculture for their livelihood, Madhura Swaminathan, head of the economic analysis unit at the Indian Statistical Institute, Bengaluru, and chairperson of the MS Swaminathan Research Foundation, told IndiaSpend. Although she did not suggest an ideal allocation figure, it should be “much more” than presently allocated, she said. Farmers will welcome the one time cash bonanza that is expected to be offered in the budget, but it will not make much difference in the long-term, she added. Though farmers will welcome it, funds should go into agriculture investments, said Himanshu, adding that public investment has a long term impact like stabilising income and creating assets.